First summer patio plants and veg packs now in for Easter. Find out about late shopping and our new rewards club, Flourish! Our plants are available at outlets across Suffolk - click to find out where! Our 2019 show schedule is taking shape too. 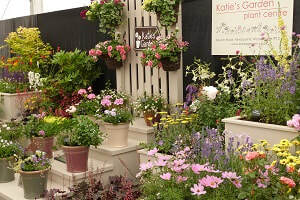 Katie's Garden Plant Centre is an independent, family run nursery in Suffolk. Most of our stock is grown by us on our two-acre site, so we can be confident that the plants we sell are strong and healthy and should thrive with the right care. Our carefully selected range includes perennials, roses, lavenders, bedding & annuals, herbs, alpines, climbers, grasses, shrubs, ﻿ferns﻿, trees and conifers as well as fruit bushes, vegetables, bulbs and more, depending on the season.